Invisalign® treatment is a popular, “invisible” alternative to braces. This technology has been around for two decades, and we at Fraserview Dentist trust it to straighten teeth and treat dental alignment problems. In fact, more than 4 million people have opted for Invisalign® treatment to straighten their teeth. Invisalign® treatment is a way to achieve a healthier, more attractive smile. Speak with one of our dentists about an Invisalign® treatment consultation during your next visit. What Makes Fraserview Dentist So Great? With benefits like free parking, and evening and weekend hours, we're here to accommodate you! Find out why we are so highly rated in our reviews. 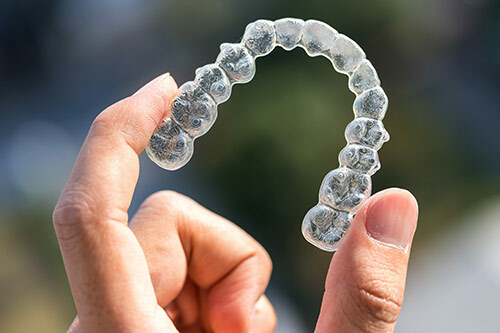 Invisalign clear aligners work similarly to braces, in that the plastic aligners apply force to the teeth to move them into straighter positions. With braces, the wire that runs across your teeth pulls them into place. With Invisalign treatment, the plastic aligners push your teeth into the correct position. This series of aligners slowly adjust your teeth to your end result. Plus, they are similar to retainers and fit comfortably in your mouth. What Is Getting Invisalign® Treatment Like? Start with an Invisalign treatment consultation, and we’ll tell you if you’re a candidate for the process (most cases are). If you are, then we’ll take either a physical impression or a digital scan of your teeth. That way, we end up with a 3-D model that allows us to create a specific treatment plan. Your treatment plan is specific to your mouth and maps the movement of your teeth throughout the realignment process. You can see previews of how your teeth will move and get a digital rendering of what your smile will look like when you’re all done. The Invisalign® company created a special plastic aligner, called SmartTrack, that moves your teeth and is barely visible. You wear your aligners for 20 to 22 hours a day, even while you sleep. The only time you should take them out is to eat, brush, and floss. Remember, proper dental care is essential during the Invisalign treatment process, so never skip brushing or flossing. Some patients switch sets of aligners every week. 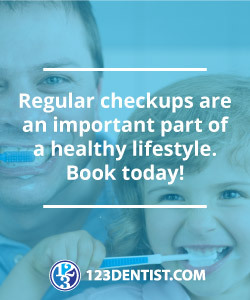 You’ll have checkups frequently, usually every four to six weeks, to see how treatment is progressing. Sometimes, the aligners need extra grip to properly move your teeth into position. In these cases, enamel-colored ridges (called “attachments”) will be temporarily attached to the surfaces of some of your teeth. The aligners can then grip the ridges and move your teeth more effectively. Some adults experience a feeling of soreness while wearing or when removing the aligners. Others may feel that their teeth are loose when the aligners are out. Both of these feelings are normal; your gums are adjusting to your moving teeth. Both feelings will pass once you’re done with the treatment process. On average, Invisalign treatment takes 12 months for adult patients. Teen patients are also eligible, but treatment times vary more widely for teens than they do for adults. What Dental Issues Do Invisalign® Clear Aligners Treat? 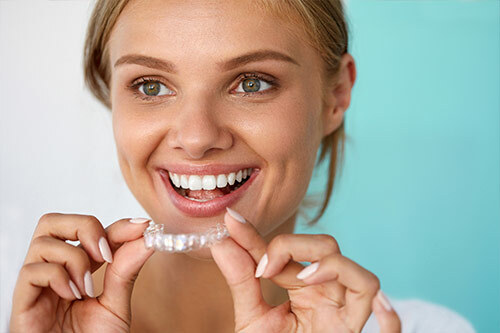 Invisalign treatments take care of lots of orthodontic and cosmetic issues like gaps between teeth, bite problems (overbite, underbite, crossbite, and open bite), and crowded teeth. Getting your teeth straightened with Invisalign treatment is for dental health as well as for cosmetic reasons. Many of the problems Invisalign braces treat will be detrimental to your dental health down the line if you leave them untreated. One common reason we use Invisalign clear aligners is to treat gaps between your teeth. Some gaps occur because of the way your jawbone has grown, while others are due to missing teeth. Either way, gaps are entry points into your gums for bacteria. Other gum problems also occur because this area isn’t protected. 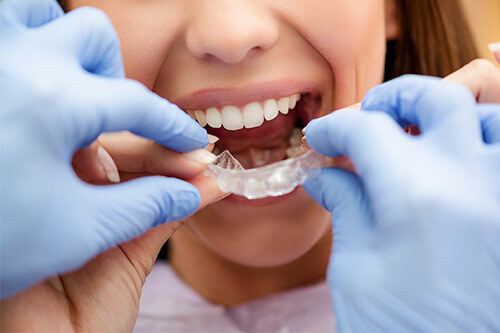 Several major bite issues exist, and Invisalign® treatment is an option for all of them, depending on your specific bite problem and its severity. Overbites happen when your top teeth extend down past your bottom teeth. This issue can cause wear on your teeth and, in some cases, leads to bite and jaw pain. Underbites are the reverse of overbites, in which your bottom teeth extend over your top teeth. Some underbites prevent people from being able to do regular things, like chew food well. They also cause jaw pain and other problems down the line. A crossbite is when only some of your upper teeth fit inside your lower teeth. These bite misalignments happen on the sides of the mouth and the front of the mouth. They can cause your teeth to wear unevenly, give you gum problems, and even contribute to bone loss in severe cases. With an open bite, your front teeth don’t touch when your back teeth are together. You might suffer from speech impairment or a temporomandibular joint (TMJ) disorder if you have an open bite. If your teeth are crowded, that means your jaw doesn’t have room for all of them. Crowded teeth are difficult for dentists to clean and treat, so plaque might build up in hard-to-reach places. Gum disease and uneven tooth wear is more common with crowded teeth. Often, crowded teeth look very crooked, so people want them fixed for cosmetic reasons as well.